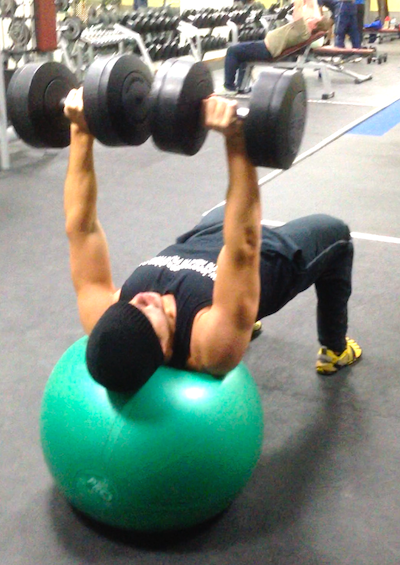 Chest Press -Bench or Ball ? Therefore you can clearly see that anyone performing a bench press are simply chasing vanity and muscle mass and not functional conditioning their body. In my opinion, the human body has changed genetically over thousands of years but has never needed to strengthen a push pattern laying on our backs. Functionally we push things standing up, and using our whole body in a integrated movement. Therefore, building strength in a push pattern laying with your back on a bench would create a dysfunctional neurologically imprint on your nervous system, that would decondition your body away from a integrated standing push pattern into a push pattern laying down isolating your chest muscles. One of the most common injuries associated with weight lifting is a shoulder capsule injury as a result of too much bench press. Traditional teaching shows that typically when performing a bench press the bar is lowered until it touches the chest. The problem with this exercise is that it requires a greater range of motion (ROM) than is found within the shoulder joint of most people. It is very important to work within the ROM of you shoulder joint in order to prevent injury. On top of this because a bench press is performed on a flat bench the normal movement of the shoulder blades is restricted, this will overtime causes shoulder impingement and leads to pain. Always perform a push pattern for example a bench press within your shoulder range of movement. As a rule if you have shoulder pain and still wish to chest press, lying on the floor would restrict the range of movement, making the exercise safer. But ideally using a Swiss ball allows your scapula to retract and move in the correct way in relation to your shoulder joint. Also pressing on a Swiss ball integrates the whole body within the push pattern, working your legs, arms and abs as well as all the muscles you would use in a standard bench press. When performed with correct form and proper shoulder range of motion, a standing cable chest press would be the most functional movement, integrating the whole body and allowing the scapula to work correctly. Please book the Initial Consultation session with myself if you require more information on shoulder biomechanics, exercise techniques or would like me to perform a shoulder range of motion test.